My role was to support a teacher in conceptualising, designing, development and implementation of an online learning activity. Compulsory elective subject in a bachelor curriculum for Social Work. Students (approx. 40) attending the course into their 3rd or 4th term, having completed several courses covering theoretical and methodical basics of the field. Students have to deliver a report on a project they have worked on during the course. This is a group work of 3-4 students and delivered at the end of the term. I have focused on opportunities to improve efficiency and effectiveness of group collaboration in this course. I decided to use blended learning elements which would allow to guide students towards group work and communication in a virtual environment. I selected administrative, organizational and methodological elements of writing a term paper which could be supported by with online components. The measure of success was a reduction of administrative and organisational efforts by the teacher and administrative staff. 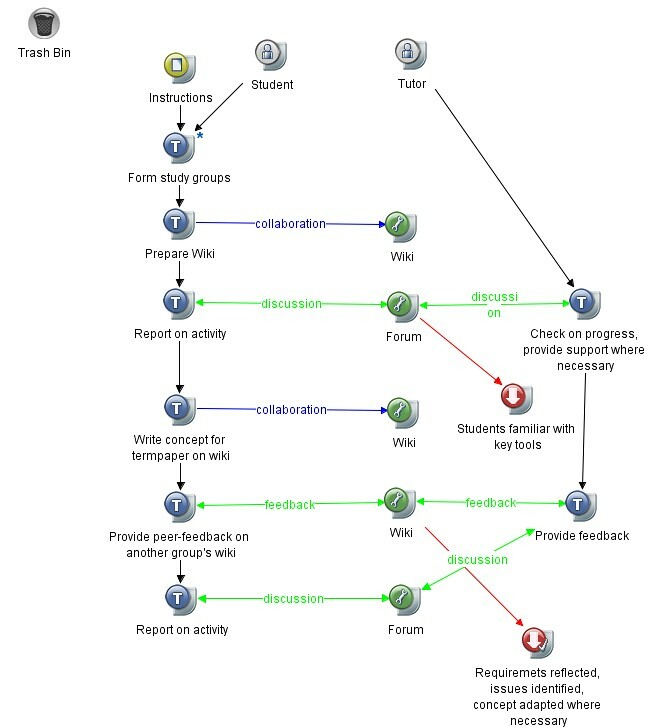 I also included elements of reflection and evaluation for the students to take an active, participative, and critical role (providing peer-feedback at several stages of the paper writing process). The success factor was a consistent quality in the term papers delivered, not below the quality of previous papers delivered in the standard course format. Together with the teacher in charge I drafted a concept for the course, including goals, key stakeholders, format and sequence of elements included, implementation of a pilot, implementation of the final course, and evaluation by students, teacher, and supportive staff. The result was a common understanding of the goals as well as the actions to be taken and related responsibilities. I then developed the main elements and run a pilot with a few selected testers not yet involved in the course design. It turned out that several elements were not sufficiently described or did not work exactly the way they were intended. On the basis of the pilot we adapted the course design were necessary and then run the course for an entire term. At the end of the turn we evaluated the results, questioned students, staff and teacher and analysed the overall outcomes. The papers delivered were of a consistent quality at about the same level as in the previous version of the course (without blended learning elements). The effort for preparing and developing the course was significant, during the course support and occasional adjustments were necessary which also meant some additional effort for both teacher and supportive staff. However, most of the issues could be resolved for the next term and without the one-time preparational efforts qualitative as well as quantitative objectives could be met. A survey conducted among the students showed that most of them appreciated the design of the course, but would have liked to use the space for further collaboration more extensively. It is important to create a detailed design of the course - including goals, key stakeholders, elements and sequencing, evaluation, etc. - in order to make sure that all involved parties have the same understanding of the project. However, even with a detailed design there are issues which cannot be anticipated and therefore running a pilot with people who have not been involved previously is crucial to discover any gaps and flaws. At the end, an evaluation can reveal further gaps and issues, but also provide input for further development. This is quite a similar example from CompendiumLD documentation. In this design the narrator is making an assumption that using a VLE would result in a lower administrative workload. This was not borne out in the first year, but having done the initial work, the workload would be lessened in the second year. The effects of the design seem to be grounded in evidence, as a survey was conducted to guage student experience. I would regard the conclusions as well founded, as I have similar experience in using a VLE. The initial setting up takes time, but bears fruit in subsequent years. I found the attention to detail in setting up the course positive. The author has tried to anticipate as many issues as possible, but has also acknowledged that were unforseen, and plans to implement changes to improve the course. Your design narrative is clearly articulated and I found it easy to follow. I think this is because you've take the effort to the context really well. I also appreciated your reflection, I guess I just wanted to know a bit more about how you felt personally about all the work you put into this (seems an awful lot). it sounds like you thought it was worthwhile, but I may be reading between the lines a bit? thank you both for your feedback. What I have not made explicit in my design narrative is that this course was meant to serve as a textbook example. That probably explains why I have put so much work and detail into it - which seems a bit out of proportion otherwise. Without this second purpose I might have felt different about the result personally. Thank you for your feedback, Vicky. In fact, I initially tried to use just one icon to represent the wiki (and the forum) and arrange all activities around it. But the result was rather confusing with a lot of arrows crossing each other so I decided to go back to this more linear arrangement. The good thing about CompendiumLD is that you can easily move around icons.